No, not a fireworks accident. Just a stupid stairway accident. Yesterday (1 January) I ran, yes ran, upwards stairs, stumbled near before end and my right hand hit the fence in an unfortunate way, between the middle and ring fingers, as in the Vulcan salute (Spock hand). 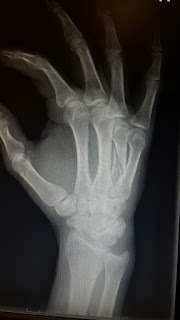 The fourth metacarpal bone (the ring finger's one) of my right hand broke with a somewhat awkward fracture. 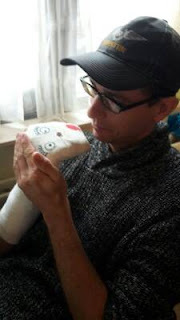 Now my entire right hand, except the thumb, is in a 90 degrees position in plaster cast, in a sock puppet position. The expectation is that this accompanion will last 6-8 weeks. I can't use the keyboard anymore in a normal way. I can type reasonably with only my left hand, but all the special character and navigation keys which are most used when writing code are all on the right side of the keyboard. As my left hand isn't entirely used to that position, programming is a hell of a job. I'm at least 10 times slower this way. Fortunately my left hand is the most experienced mouse hand, so I can still visit and browse Stack Overflow, and close some duplicates, but I'm afraid I'll be writing much less answers as they usually involve code snippets. As my thumb is free, I can still use the mobile, but I wholeheartedly hate writing code on a mobile keyboard. It's even more slow than doing it with only one hand on a desktop keyboard. 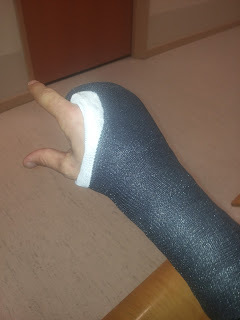 Perhaps I will during the 6-8 weeks practice a bit with programming with only my left hand. We'll see, or else I may be on a necromancer spree when my right hand get freed up. 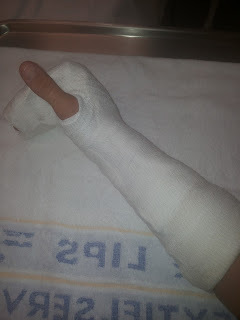 Update: today (11 January) I got new fiberglass cast, whereby my index finger finally get freed up! It's much lighter and more convenient. I can finally type somewhat reasonable with my right hand, although it's still like as if I've never typed beforehand and are practicing my first type lessons with only the index finger stiffly dancing over the right side of the keyboard.